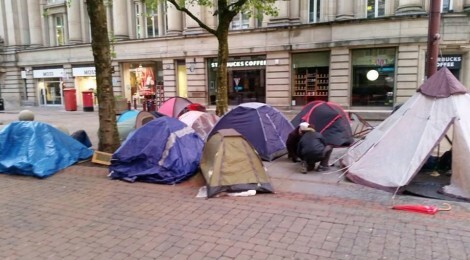 April 2015 saw the start of a self-organised homeless camp in the city of Manchester. A march against austerity culminated in 30-40 people coming together. People who are homeless often sleep separately or in small groups. This leaves individuals open to assaults from others in the city, regular harassment from the police, and the danger of violence. Those who are most vulnerable, young women, face a terrible time. Living in the supportive atmosphere of the camp allowed many who had previously felt more isolated and vulnerable to be able to tackle other issues. Those in the group were varied. There were ex-prisoners, young single women, many substance abusers, and older people who acted in a parental role in the group. One man with cancer joined the camp, relaying that he was unable to access treatment because he was living on the streets. Local anarchists also joined the homeless to offer their solidarity, and at first acted as advocates, dealing with the police and the council. While some have had to move on, others have stayed. There was a good ethos at the camp with sharing of resources. Someone from the Community Bandstand group loaned a PA and music was played around the site of the first camp. This had a very positive influence both on the camp members and on the other city users as it served to break down barriers between the two groups and reduced the invisibility of the homeless people. Food was donated by local people and already established street food kitchens. Those in the camp were no longer always hungry and were able to begin to tackle other issues around benefits and health. Unsurprisingly, there has not been a wonderful response from the established charities, the council, or the police. Shelter, charity for the homeless, continued to fundraise near the camp but did not in any way help those who were actually in need of it. The AF has always been critical of charities, who often exist to provide for their own bosses (in the form of high salaries and expense accounts) at the expense of those they supposedly want to help. Charities also make it possible for the state to ignore problems that people would usually force them to deal with otherwise. The council offered housing to some people who were sleeping rough but not all, claiming that there were people who were intentionally homeless. As one of the people from camp said “Nobody wakes up and decides to sleep on the streets. Many of the group haven’t even been offered something temporary. We want permanent housing for all.” Those who were offered somewhere with a roof said the offers were patchy and did not account for their needs. They were in hostels or group homes, lacking security and privacy. In an act of almost unbelievable underhandedness some have been put in hotels several miles from the camp area, places which do not accept couples and which deny people the right to take their dogs who are, for many, their sole security and companionship. This tactic of divide and rule almost beggars belief, forcing apart the community which has been built up. Police harassment has been ever-present. The camp has been moved on twice by police and now exists split between three separate sites. This makes supporting one another difficult and any problems that arise have become harder to deal with. One of the anarchists who has been closely involved from the early days commented that this venture has faced many problems. Firstly, as a result of people being used to told what to do all their lives, whether in the prisons, mental hospitals, schools or army, it has been impossible for the campers to establish a non-heirarchical, horizontal way of organising and making decisions. Also, while some campers were able to introduce a safer spaces policy, there has not been enough outreach to create a collective understanding of what such a policy means and how it should be applied. Alcohol and drug use has led to argumentative behaviour and the need for more confident peacekeepers is great. The people who become loud and aggressive can and have been successfully asked to leave, but with only a few people there able to do this it has not always happened, leading to some leaving the camp due to safety concerns. When anarchists have been sleeping at the camp the police have usually stayed away, but as soon as they took a break the cops came back, arresting and harassing in their old style. The early days of the camp show that it is possible for this kind of venture to provide safe place for homeless people to live and regroup, but, without solidarity in the struggle, it can be difficult for those sleeping rough to break down the oppressive structures they face. While there have been splits and setbacks it is felt that the camp can rebuild and hopefully, together, we will see a new space grow. You can read more about the camp on WTB Solicitors here.